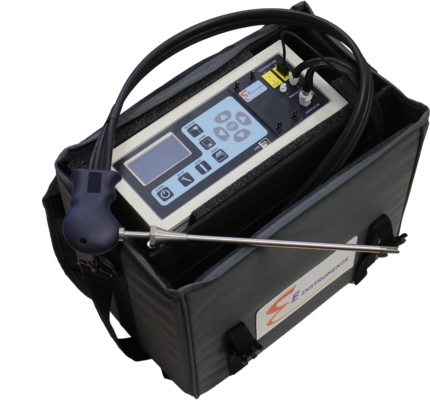 The new E8500 plus emissions analyzer from E Instruments is a complete portable tool for EPA compliance level emissions monitoring and testing. The E8500 PLUS is ideal for regulatory & maintenance use in boiler, burner, engine, turbine, furnace, and other combustion applications. The updated “EGAS” software package includes the ability to save & graph data in real-time in the field with a laptop or in a laboratory with a PC. It also allows the user to automatically log data for an exact number of tests for a specified time period. Communications between the E8500 PLUS and a computer are established either by wireless Bluetooth communications or USB cable. A Bluetooth wireless adapter for a computer comes standard with each E8500 PLUS gas analyzer. Data from the “EGAS” software can be exported to other spreadsheet programs for more user flexibility to create detailed emissions reports. The internal thermoelectric chiller efficiently and quickly removes the water vapor from the flue gas sample to prevent combustion gases from bubbling from the gas phase into the condensate.